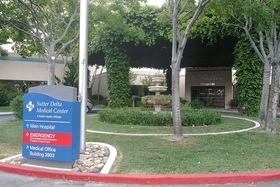 Sutter Delta Medical Center in Antioch is one of 24 hospitals in Sutter Health's network. Sutter Health, long accused of abusing its market power in California, is squaring off against major U.S. employers in a closely watched legal fight over healthcare competition and high prices. The latest fight has erupted over Sutter's demand that employers sign an arbitration agreement to resolve disputes. Without it, Sutter says employers must pay sharply higher rates—95% of its full charges—for out-of-network care at its hospitals, surgery centers and clinics. Sutter disputes the allegations and says its charges are in line with its peers. In a March 16 court filing (PDF), David Lansky, chief executive of the Pacific Business Group on Health, said it isn't feasible for large employers with Northern California workers to exclude Sutter from their insurance networks, given its size and reach. His members include big employers such as Wells Fargo, Intel and Chevron as well as government agencies like the California Public Employees' Retirement System. “Their choice is between two unacceptable alternatives: Pay 95% percent out-of-network pricing for enrollees that access Sutter services or agree to give up their claims in this litigation” by consenting to arbitration, Lansky said. Major insurers have split over Sutter's move. Industry giants Anthem and Aetna are urging customers to accept arbitration in order to remain in the network while rival Blue Shield of California said it opposes Sutter's request. Blue Shield has clashed publicly with Sutter before over contract terms and prices. All this comes amid growing concern nationwide about the financial toll from industry consolidation as big health systems amass market clout by acquiring more hospitals, outpatient facilities and physician offices. The current fight centers on larger employers that tend to self-insure because they have the financial resources to pay their own medical claims. They often hire an insurer to negotiate with hospitals and other providers for discounted rates as part of their health plan network for employees. Sutter insists it won't use the arbitration agreements to prevent employers from participating in the class-action lawsuit brought by a grocery workers' health plan in San Francisco County Superior Court. Sutter, a Sacramento-based nonprofit, has 24 hospitals, 34 surgery centers and more than 5,000 physicians in its network. It reported $11 billion in revenue last year and an operating profit of $287 million. The health system said it only sought the new agreements after a state appellate court ruling last year. The court said the plaintiff suing Sutter, the United Food and Commercial Workers and its Employers Benefit Trust, wasn't bound by the arbitration provisions in the contract Blue Shield signed with Sutter as the health plan administrator. Sutter said it's asking employers and labor groups to review and agree to its contract terms directly so there's consistency among all parties involved. Arbitration is widely used by companies of all types to help resolve disputes and avoid costly litigation. But attorneys for the grocery workers' health plan are asking the court to stop Sutter from seeking arbitration agreements because they say it's an attempt to hinder the litigation. A hearing on the matter will be held April 7. Bill Kramer, executive director of national health policy at the Pacific Business Group on Health, agreed that Sutter's threat to pull all of its facilities from an insurance network took employers by surprise. The lawsuit over antitrust violations and unfair competition alleges that Sutter's hospital prices in San Francisco have exceeded those of competitors by as much as 56 percent. It also says an overnight hospital stay at Sutter hospitals in San Francisco or Sacramento costs at least 38% more than a comparable stay in the more competitive Los Angeles market. Employers began expressing concerns about Sutter's move in recent weeks after insurers raised the issue. In a Feb. 22 memo to customers, Anthem said it “must now obtain a signed attestation from all California-based self-funded customers and all Anthem national accounts with 50+ members in Sutter's Northern California service area.” Many customers face a May 16 deadline to sign, according to Anthem. The insurer noted that state and federal investigations into Sutter's market conduct haven't yielded any results so far. California Attorney General Kamala Harris has been investigating Sutter and other big medical providers for several years over potential harm to consumers. A spokeswoman said the agency can't comment on any ongoing investigations. Meanwhile, Sutter accounts for 28% of Anthem's medical spending in a 21-county area of Northern California, according to the insurer. Anthem and Blue Shield both declined to comment further on the Sutter matter. The grocery workers' self-funded plan suing Sutter is a customer of Blue Shield. Melnick and other experts say the lack of competition in Northern California helps explain why health insurance premiums are about 25% higher, on average, compared to the southern part of the state. Covered California, the state's insurance exchange, has reported a similar pattern with an average rate increase of 7% in northern California this year compared to 1.8% for policyholders in southern California. Major Employers Decry Sutter Health's Tactics In Dispute Over Prices was produced by Kaiser Health News, which publishes California Healthline, a service of the California Health Care Foundation.